This tiger, ready to be ridden in a business setting, has little chance of success without proper key wording. Every once-in-a-while I go to the site of one of the agencies that represent me and search for things that I know I have. I do this for two reasons. First, to get a sense of how long it might take someone to find my images, and secondly (and more importantly) to make sure that the keywords that I need on my images are there. What is prompting this post is that I just searched “business and tiger” on Getty and one of my tiger images, one that I created specifically for the business market, doesn’t show up. Time to get on the horn to Getty! Checking the keywords on my stock photos is not my favorite activity. Actually, it is right down there with doing my taxes. But it is also a vitally important activity even for us “traditional” shooters whose agencies do the key wording for us. 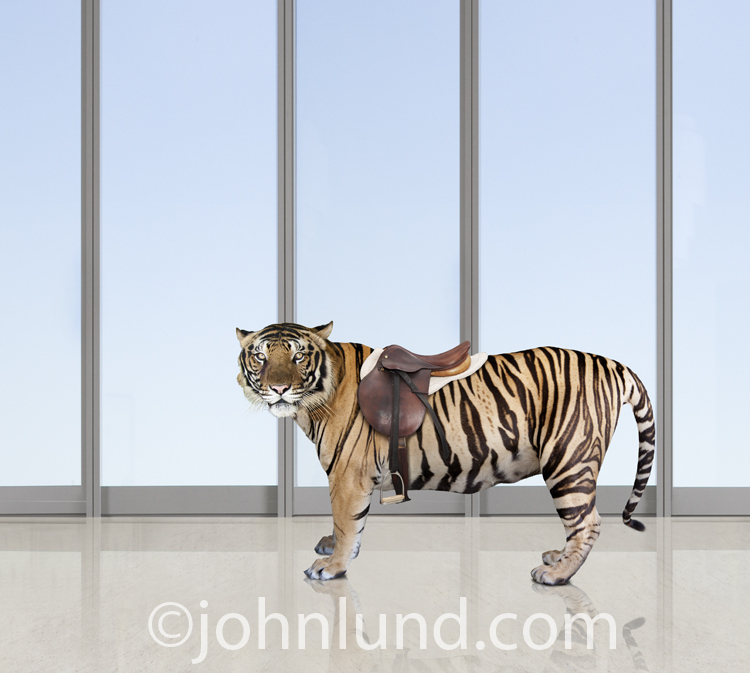 Here is the caption on the Getty site that goes with this image “The phrase 'Riding The Tiger' can be applied to my photo of a Tiger wearing a saddle in an office setting.”. But it doesn’t show up under “Tiger and business”? Strange! Two weeks ago I was searching Corbis Motion for some of my slow motion clips. Get this. The key words “Slow Motion” are not on any of my hundred plus slow motion clips! In fact, if you insert the words slow motion into a search you specifically don’t get my clips in the results. We are working on that little problem now. It will get resolved, but it is another important reminder that with out the right keywords you aren’t going to make any sales! In my mind visibility is the overriding challenge to stock photographers. Key words are biggest influencer of visibility. But once we have dealt with that aspect, what else can we do to get our images seen? Some of my microstock friends tell me that it helps to create light boxes, and to participate in the forums to get favorable reviews on your images. There are probably other strategies as well, but as I haven’t participated in microstock I am not familiar with them. I do think it is important to have some work with an aggregator agency, such as Blend, Tetra or others (disclaimer…I am part owner of Blend Images). By having work with an aggregator it gets seen in far more places. With Blend RM, for example, your work is seen on Getty, Corbis, Superstock, Masterfile and countless agencies throughout the world. As I have mention before, you can also get work into the TAC (The Agency Collection) with aggregators…something you can’t do even if you have a Getty contract (go figure). Finally, you can put your work up on your on site with links to where they can be licensed. Then (ahem) blog about them, share them on social media sites, feature them on sites like 500 pixels and oneyeland.com/ and such. It is all a lot of work. But then, back in college when I tried to earn money selling life insurance it was a lot of work as well…and I didn’t enjoy it as much (at all actually), or make nearly as much money!